So the end of term atmosphere continued at Blenheim today. I saw many riders smiling and chatting and positive sounds were being made about the new “chill out zone” in the lorry park. The organisers have chosen to hardwire an internet connection to the lorry park to ensure decent WiFi so riders and their teams can keep their internet followers up to date with the goings on – something that has, for years, been nigh on impossible due to the lack of a decent 3G signal in rural West Oxfordshire. Pizza take out is also proving popular! Biffa Bins make their presence known! I had another look around the shops today and actually found some really good bargains, so I take back my initial thoughts of yesterday…I am just obviously not very good at sniffing out those sales tickets! Today I took a look at the courses the valiant riders and steeds will be taking on tomorrow and Sunday. I had to do this flying solo as a yard emergency meant that I could not partake in the Sam Griffiths course walk later in the afternoon. 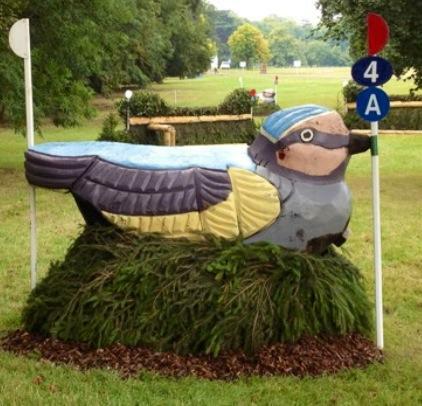 As always, David Evans has built some beautiful fences – I was especially taken by the gorgeous painted birds making up the combination at 4 on the CIC course – and it is evident as to why he is in demand around the world. Eric Winter has reversed part of the course this year, and so fitness will certainly be important for the CCI horses, who are facing a longer distance this year with some good galloping opportunities between questions, including the tough uphill run to the arena. After the standard few introductory fences riders will be faced with two 1.20m high, 1.80m spread tables on a curving line of three strides. These fences are situated next to the main thoroughfare into the shopping village, and have white containers stacked beneath them, and so riders will have to be sure they have their horse’s attention. Onwards to the event’s main sponsor fences, The Fidelity Fund Finder, two impressively big brush corners that are jumped downhill and I am sure those with horses who like to express their fitness at the beginning of a course will be sitting up in plenty of time and ensuring focus! After going through the first water crossing the course goes uphill and into the woods and riders have to prepare for a combination of three fences, in the old school style of a coffin: an upright rail, ditch, and an angled rail out, so accuracy is key and riders will have to commit to a good line coming over the first element. The CIC and CCI courses split here, with the CIC riders only having to jump two fences before re-joining the CCI course at fence 11. Fences 7 and 8 for the CCI are a straight forward table and a brush with some impressively carved heads making the decoration in front, but fence 9 is a combination of brushes built on up and down lines but shouldn’t worry any combinations who allow time for their horses to lock on to the question in hand. A “pick your side” log pile at 10 will be flown over before combinations enter what Eric has dubbed “the most intense section of the course”. Those who have been to Blenheim before will recognise the barrel studded tables that make up “Abingdon & Witney College Bar”, fence 11a & b, and then there is a downhill run to the water, this year known as The Karcher Crossing. Two angled brush topped houses, with a very small target area, need to be ridden carefully and the horses need to be bold as they are jumping into the water over the second element. A good jump out of the water over a brush step up and a good line to the angled, and beautiful, wooden dragons, the Fidelity Multi-Asset Multi-Fence, will have riders breathing a quick sigh of relief before kicking on over a great “rider-frightener”, a suspended rail with a ditch and a big drop on the landing side, taller than me and I am 1.78m! Fence 15 will draw crowds as always, it is named the Kubota Klipspriner this year and incorporates a bounce up a step and over a decent roll top – athletic horses will make this look easy. Eric Winter’s comments in the programme “within less than 1 minute 30 seconds they will have jumped nine fences with some extremely different questions – which is why I said this is the most intensive section of the course”. The usual gallop past the shopping area takes the riders back down into the woods to jump two angled fences and then over the train, which is rather more of a question than I thought once I stood next to it! I rather staggered up the hill back to the main arena, so I can imagine that horse fitness will be a real test here, and then the course takes a run into the main arena and over the usual shooting butts (great photo opportunities with the palace behind! 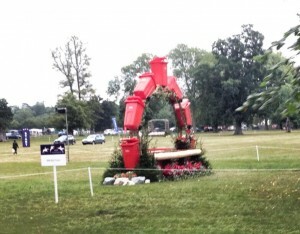 ), out the other side and on to Olympic fences – the houses at the ever present Ariat Dew Pond were used in London 2012, and riders need to choose one and then splash through the pond to a really very narrow triple brush – if your horse isn’t one to stay onside when tired you may have problems here! Fence 22 is another Blenheim rider frightener that looks impressive but always rides well, the massive ditch fronted upright brush, and then riders turn for home. The double of stone houses should not cause problems for fit horses, but those with tired mounts may feel a real stretch beneath them. The final real question on the course is the Bates Saddle Rack – up a slope, over a good sized rail and then on to a skinny with a carved saddle topped brush and then only one fence left…and OMG is it a fence! Biffa Bins are a new sponsor this year and they have sponsored the final fence, and adorned it with bins! Everyone entering the show ground through the main entrance will not be able to miss the fence, it is very present and I do hope no horses have a complete sense of humour failure at this point (mine would!). So there you go, your course for tomorrow. There are slight variations on the CIC course but the guts of the track are the same. 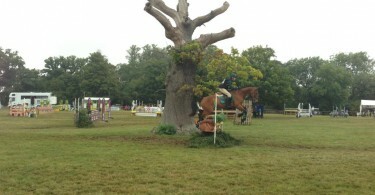 There are no easy rides at Blenheim! And it is tight at the top of the leaderboard – the top 16 are all in with an absolute shout for the title, being within 2 SJs of each other, and so time penalties are definitely going to play their part tomorrow. Sarah Bullimore is leading with 38.9 penalties with Aoife Clark right at her heels on 40. With the vast amount of rain we are experiencing this evening it will be interesting to see if going comes into play – I know I am looking forward to watching events unfold!